You know that feeling: that feeling between excitement, terror, and doubt that hits just as you’re about to put a social-media post for your brand live. Did you use the right words? Is the timing right? Are you using the right channels? A part of you questions, “Am I doing this right?” and another part urges, “Just do it.” So you take a deep breath and press Post. Does my brand even need social media? For many entrepreneurs (especially those born before the Millennial era), social-media marketing is an uncharted territory for your brand. Sometimes the stakes feel so high that you break into a cold sweat every time you even think about making a post. Many people find it so challenging they simply avoid social-media marketing all together. However, the truth is that the stakes may be even higher when you choose not to make use of this powerful (and often free!) marketing platform. Sure, social media is a brave new world. Even though it’s been around almost 20 years, it’s still new to many people as a business tool. What’s more, the social-media landscape continues to change rapidly, with new channels, algorithms, rules, opportunities, and also risks seemingly springing up overnight. Not to mention the recent privacy and data scandals, which have made things even more confusing for entrepreneurs and business owners. But, still, the branding potential offered by social-media marketing can’t be ignored. Why use social media for my brand? Social media has become the #1 way modern consumers connect with brands. And if your brand isn’t part of the landscape, you are letting many potential brand fans pass you by. It has a huge potential reach to new and existing clients, driving them to your site. It increases your brand’s Search Engine Optimization (SEO). 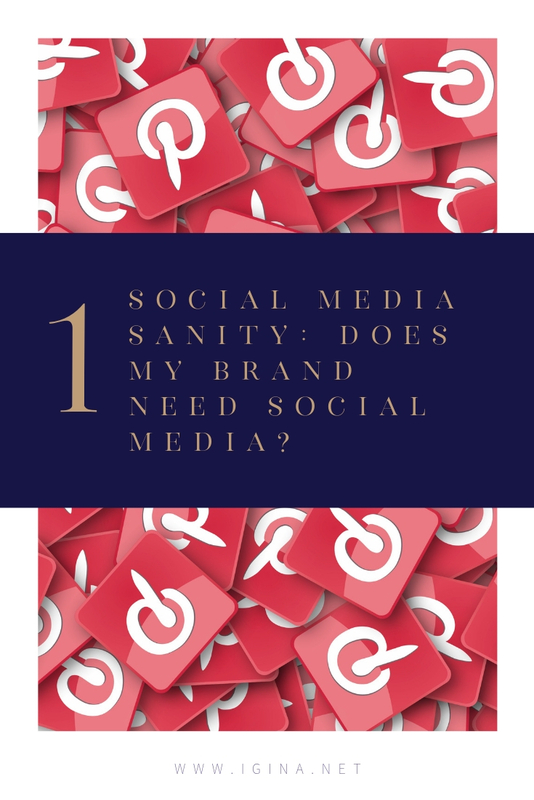 So, does your brand need social media? The answer is almost always yes. For many of you, this is a given. But we still see many of our clients struggle with posting about their brand. You don’t have to be 25. You don’t have to tweet every minute. You don’t need to panic before you post. How can I post without the panic? Of course, it’s nice to have a perfectly laid-out social media strategy (read on for more on that), but the key to successful social-media marketing is really experimentation. You can find endless advice on what to say when, a lot of very good advice, but at the end of the day you won’t really know what works best for your brand and your audience until you start posting. One of the advantages of social-media marketing is that you get feedback and data right away. Even if no one commented on your post or saw it, this is still valuable information. And even if you have a solid strategy in place, more often than not you will need to adjust it based on the data you get. The other nice thing about social-media experimentation is that the message is often short-lived, and not everyone will see it. This lowers your risk for most experimental posts. In the end, it’s the overall impression your branded posts leave that matters. You need to shape this impression, the impression you want to leave, one post at a time. Discovering your brand personality and crafting strong key messaging around that is a great way to make your brand stronger overall . But, once this is done, the point of developing a brand voice is to use it. Enter the soap box of social media. Say something truthful and honest about yourself, your brand, your products, your services, your point of view, and what is going on with your company. Ideally, it is good to have a mixture of news about your own company and other content from other sources that will help your clients. Your goal should always be helping your (potential) customers. The key is to experiment: see what fits your brand, and gauge how your audience responds. For example, one of our fabulous entrepreneur clients Jessica Kundapur wrote a book called Fabulupus: How to be young, successful and fabulous with lupus. One day she decided to post a about a positive review of her book. But she hesitated before posting. ‘Was it too self-promotional?’ she asked herself. She did it anyway. It turns out the testimonial got many shares and likes. Jessica says it makes sense to her now, as people like reading product reviews from other people. Now she routinely posts the positive comments, and they have helped more people to discover her book. She found a social-media strategy that works for her brand. We see a lot of people struggle with this because the choice of social media channels is overwhelming. But we like to keep it simple: just choose 2. If you have a business where your products can be showcased visually, more photo-friendly formats like Instagram or Facebook might be the right channels. If your company wants to share a lot of news and updates, maybe Twitter and LinkedIn. But at the end of the day, figuring out which 2 are right for your brand involves more, you guessed it, experimentation. Think about your audience: where are they most likely to see your message? Again, don’t stress; just try different outlets. Some will fade away, eventually to be deleted, and others will slowly grow and thrive. The benefit of social-media marketing is that you will get feedback almost instantly. Then you can adjust and change. How do I make it easier? Understanding the importance of social media doesn’t exactly calm the stress of actually using it. And, even more, social-media marketing takes time – planning, writing, and designing effective posts can quickly drain the little time you have left after doing the millions of the other things that you need to do to actually run your business. Luckily, help is at hand. Let us take the mystery, panic, and time out of social-media marketing for you. Explore our social-media packages and see if one of our cost-effective services is right for your business. (Or have a free virtual coffee with Gina herself to talk through the options and ask your questions.) And stay tuned to this blog for 7 concrete tips on getting more out of social media. Chances are, you probably came across this blog post on a social-media channel – so you realize just how powerful this medium is. Don’t miss the chance to reap the benefits yourself. Don’t post with panic. You’ve got an awesome company with helpful services – post with pride!